The 1953–54 British Home Championship was an international football tournament played between the British Home Nations during the 1953–54 season. This season's tournament also doubled as UEFA – Group 3 for 1954 FIFA World Cup qualification. England dominated the Championship, winning all three games and taking first place. After defeating Ireland, Scotland struggled against Wales before losing to England. Meanwhile, Ireland defeated Wales in Wrexham to clinch third place. England, together with second-placed Scotland, subsequently qualified for the 1954 FIFA World Cup. A total of 37 teams entered the 1954 FIFA World Cup qualification rounds, competing for a total of 16 spots in the final tournament. Switzerland, as the hosts, and Uruguay, as the defending champions, qualified automatically, leaving 14 spots open for competition. Groups 1 to 10 – Europe: 11 places, contested by 27 teams (including Egypt and Israel). Group 11 and 12 – The Americas: 2 places, contested by 7 teams. Group 13 – Asia: 1 place, contested by 3 teams.A total of 33 teams played at least one qualifying match. A total of 57 qualifying matches were played, and 208 goals were scored (an average of 3.65 per match). Listed below are the dates and results of the qualification rounds. Below are the squads for the 1954 FIFA World Cup final tournament in Switzerland. This was the first World Cup where the players were assigned squad numbers. Scotland were the only team to have players from foreign clubs (namely 7 players from English clubs). The Battle of Berne is used to refer to a football match at the 1954 World Cup between Hungary and Brazil, a quarter-final played on 27 June 1954 at the Wankdorf Stadium in Berne, Switzerland. Violent conduct and fighting prompted English referee Arthur Ellis to send off three players during the match. Fighting between the teams continued in the dressing rooms after the final whistle. Cornaredo Stadium is a multi-purpose stadium in Lugano, Switzerland. It is used mostly for football matches. It is a home ground of FC Lugano. The stadium is able to hold 15,000 people and was built in 1951. The stadium has 5,000 seats and 10,000 standing places. During the 1954 FIFA World Cup, it hosted one game. 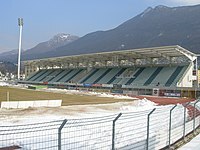 During the spring 2008, the political authorities of Lugano announced a plan to renew the stadium to fulfil the Swiss Football League requirements for Super League stadiums. The new stadium is due to be completed by 2011. Ferenc Machos (30 June 1932 - 3 December 2006) was a Hungarian football forward who played for Hungary in the 1954 FIFA World Cup. He also played for Budapest Honvéd FC. Ferenc Szojka (7 April 1931 – 17 September 2011) was a Hungarian football midfielder who played for Hungary in the 1954 and 1958 FIFA World Cups. He also played for Salgótarjáni BTC. The Hardturm was a football stadium located in Zürich's Kreis 5. Opened in 1929, it was the home of the Grasshopper Club Zürich until it closed in 2007. It was a host stadium for the 1954 FIFA World Cup. The land for the stadium was bought by Walter Schoeller who passed it on his club free of charge. When the stadium was opened in 1929 it could hold 27,500 spectators. After many reconstructions the capacity was 38,000 in 1986, on time for the 100-Year Anniversary of the Grasshopper Club Zürich. Before closing, Hardturm could hold 17,666 spectators with standing areas for the home and away fans. In international games the Hardturm could hold 16,600 spectators with seating places in all areas.During re-construction of the Letzigrund stadium, Grasshoppers shared use of the Hardturm with local rivals FC Zürich for the 2006–07 season. This led to protests by Grasshopper fans. Hardturm's demolition started in December 2008 and a new stadium, Stadion Zürich is planned on the ground of the Hardturm, but the project has been stalled (as of 2016). Imre Kovács (26 November 1921 – 9 March 1996) was a Hungarian football midfielder who played for Hungary in the 1954 FIFA World Cup. He also played for MTK Budapest FC. He won a gold medal in football at the 1952 Summer Olympics. Joseph Mermans (16 February 1922 in Merksem – 20 January 1996 in Wildert), usually referred to as Jef Mermans (nicknamed "The Bomber") was a football striker from Belgium, who played much of his career at Anderlecht, with whom he won seven Belgian Championship titles and finished top scorer of this competition twice. He played 399 games and scored 367 goals in first division.Mermans played 56 matches with the Belgium national football team, 2 of which in the 1954 FIFA World Cup. He is also the 4th top scorer ever for the Belgium national team with 27 goals. Joseph Vliers (18 December 1932 in Tongeren – 19 January 1995 in Tongeren), (mostly called Jef Vliers), was a Belgian football player who finished top scorer of the Belgian First Division with 25 goals and in 1958 while playing for Beerschot. He formerly played with Patria Tongeren and then with Racing de Bruxelles. In the summer of 1955, he moved to Beerschot and he eventually played with Standard Liège. Vliers played six times with the Belgian national team between 1955 and 1963. He made his international debut on 3 April 1955 in a 1–0 friendly defeat to the Netherlands. He was in the team for the 1954 FIFA World Cup but he did not play. Ljubomir "Ljubiša" Spajić (Serbian Cyrillic: Љубомир "Љубиша" Спајић; 7 March 1926 – 28 March 2004) was a Serbian footballer who was part of Yugoslavia national football team at the 1954 FIFA World Cup. He later became a manager. Robert Dienst (1 March 1928 – 13 June 2000) was an Austrian football forward. He died in 2000 after a long illness. Robert Körner (21 August 1924 – 22 June 1989) was an Austrian footballer. Sandro Puppo (Italian pronunciation: [ˈsandro ˈpuppo]; 28 January 1918 – 16 October 1986) was an Italian football (soccer) player and manager born in Piacenza, who played as a midfielder. Stade Olympique de la Pontaise is a multi-purpose stadium in Lausanne, Switzerland. The stadium holds 15,850 people and was built in 1904. It is used mostly for football matches. It is currently the homeground of FC Lausanne-Sport, of the Swiss Challenge League. The stadium also hosts the IAAF Diamond League event, Athletissima. The Wankdorf Stadium (German: Wankdorfstadion) was a football stadium in the Wankdorf quarter of Bern, Switzerland, and the former home of Swiss club BSC Young Boys. It was built in 1925, and as well as serving as a club stadium, it hosted several important matches, including the 1954 FIFA World Cup Final, the 1961 European Cup final, and the 1989 Cup Winners' Cup final. The Stade de Suisse, Wankdorf has been built in its place. Şükrü Ersoy (born 14 January 1934) is a Turkish football goalkeeper who played for Turkey in the 1954 FIFA World Cup.